Like I've told before I was terrified when I realized that there was something more dreadful than having a smiling wrinkles on the corners of my eyes. Learning about existence of a sleeping wrinkles has been an eye opening experience for me. And I decided right away, that first thing I will do, is teach myself to sleep on my back. Well easy to say than to do. 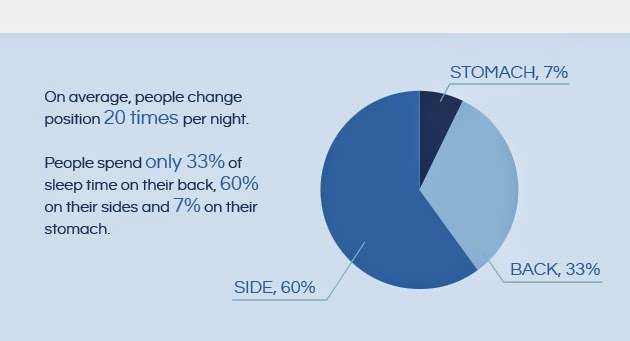 Like you can see in the lower photo people usually spend only 33% of sleeping time on their back, 60% on their sides and 7% on their stomach. When I was younger I would sleep probably up to 30 % on my stomach, 60% on my side and only 10% on my back. Luckily with growing of my bust sleeping on my stomach became so uncomfortable that sleeping on my stomach behaviour has been eliminated from my sleeping pattern entirely. Unfortunately that means that I sleep even more on my sides and the left side the most. Which my very first sleeping wrinkle can tell. Last night for the first time I forced myself to sleep on my back. Saying that I didn't sleep well last night would be an understatement. It was a nightmare. I tried everything I could to make myself stay on my back. Firstly I tried a technique which I remember learning from a physical education instructor. It is thinking of each of my body parts and telling myself that they are "relaxing". Starting from my toes and going slowly to my head. It worked and I did even fall asleep, but woken up from the urge to turn on my side. I tried to fight, but then let it go and turned on my right side. I did try to eliminate risk of sleeping on the side by putting my pillow in such a way that only part of my head would be on the pillow and my face wouldn't touch it. That position worked slightly, but wasn't too comfortable. After a while I made myself turn on my back again. Sleeping only on my back FAILED. Not sleeping on my left side ( which now easily gets a red line after sleeping ) was a SUCCESS. Having a good night sleep FAILED. This is a great post, i must say. I also face the same thing and got wrinkles on my face and i wake up in the morning. haha. i never thought i would see statistics of sleeping positions on a blog post. But this is really fun to read and informative to know. Thanks for the info mate!